Today, electric shavers have become an essentiality for men and women alike. They not only save your time but also keep you away from shaving bumps and infections. In just a couple of minutes you can get rid of your facial and body hair with an electric razor, while it would take hours to do so through other means. However, maintaining electric razors can be a daunting task. You have to keep them clean and hygienic to ensure no bacteria is transferred to your skin. Most electric razors come with a cleaning kit and you need to use it to keep your razor clean. Start with gathering the tools you will need to clean the razor. If you did not get a bristle brush and a cleaning liquid with the razor, you can use an old toothbrush and some alcohol. Medicated cleaning liquids are best for this purpose. 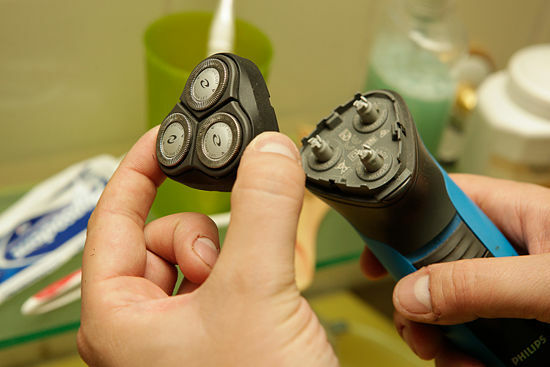 Remove batteries and cords from the shaver and unscrew the part where the blade is. This should be pretty easy. Most electric razors are designed in a way that they are easy to detach and clean. You should be able to easily remove the blades from the body for cleaning. Now, use the bristle brush to remove any debris or hair that is there inside the machinery through the open area. You will be able to see debris easily since now you have already removed the blades. Your next step is to take a cotton bud and dip it into the cleaning liquid or alcohol. Wipe the blades carefully with this cotton. Alternatively, you can dip the razors in the liquid for some time but that would require a lot of fluid, which would be a waste. It is recommended to use the cotton method. Let the blades dry for a while. Make sure you keep them in a place where there is sufficient air and light. You do not want water to leave traces on the blade. Now, assemble the blades with the body as it was before. Make sure you put the blades in the right manner.